What lovely weather awaited us, as we joined Pete Seymour, Nick and Debbie, Paul, Steve and Jenny - all from different parts of the South but all members of the OCA - at the campsite neat Dulverton, Exmoor. 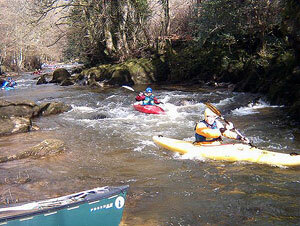 Because of low water, it was decided to put in at Marsh Bridge and paddle down to Exebridge. The sun sparkled on the water as we went down many little rapids. Philip poled down all these and I joined him when the river slowed down a bit. 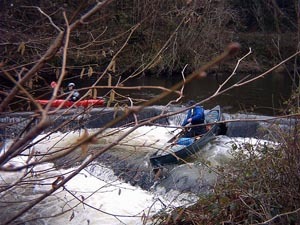 There were one or two friendly youth groups on the water too and we helped fish out the odd kayaker now and then. There was fun at the salmon steps below Dulverton. The open canoes went down fine but a couple of kayakers came out. One kayak was firmly held upside down in a stopper and I wondered how they could possibly get it out without being trapped too. However, an instructor calmly sidled up and released the vacuum by lifting the cockpit. Then gradually both were moved out by the water and all was secure. Late on, some of us went down a slide weir with a tight turn. I had been kindly lent Debbies's Mad River Freedom Solo & a light, fast and manoevreable boat, which responded well in the turn. On overbalancing, poling down a later rapid, it was somewhat tippy and I only just managed to avoid capsizing and ramming stationary boats!